Industrial gears can simply be used to transfer rotational motion, or the interlocking of gears with unequal diameters can produce a change in rotational speed and rotational force (torque). Gears are used extensively throughout industry, and they are essential to the functioning of many kinds of industrial equipment and products. 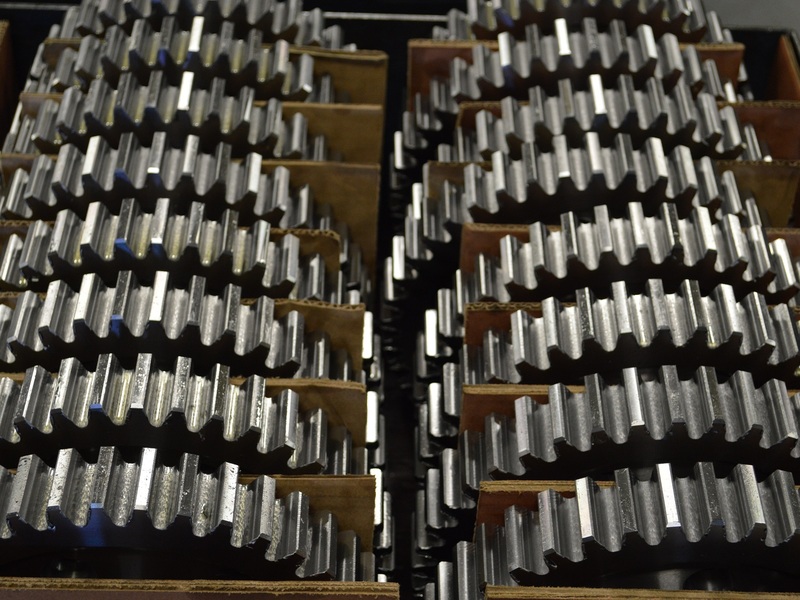 Many manufacturing equipment varieties depend on gears as their source of movement. Bevel gears, spur gears and other gear varieties are necessary in all vehicles for the transmission of rotational motion between an engine and a vehicle’s moving parts. Materials handling, food processing, textile manufacturing, clock making, heavy industrial mining equipment and oil rigging equipment depend on gears for the transmission of motion as well. Compared to gears applied in commercial and consumer products contexts, industrial gears are usually characterized by heavy duty construction and durable metal composition. Spur gears are the simplest and among the most common industrial gear varieties. They are also known as “straight-cut gears” and feature straight teeth radiating in alignment with their axes. Spur gears are often used as sprockets, which are thin gears with teeth that lock easily into roller chains. 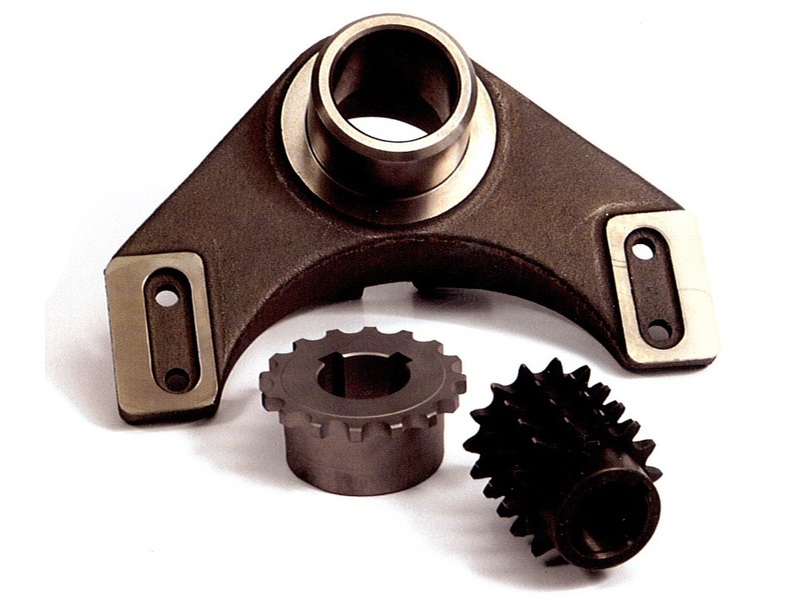 Sprockets act as a non-slip pulley for power transmission applications; they can be used in combination with bicycle chains, tank treads and other similar chain or tread based movement apparatus. Cylinders or rods with straight teeth are splines, which are used to transmit motion laterally. Planetary gears are among the more complicated gear systems. They contain one central spur gear, or “sun gear,” surrounded by three or more “planet gears;” the exterior gears interlock with the inward-facing teeth of a larger internal gear, increasing the output speed of the large outer gear through rotational torque applied to the internal sun gear. Planetary gears and other gear configurations like helical gears and differential gears are by nature much more complicated than spur gears. Spur gears can be used in simple and complex applications, but planetary gears are used in drivetrains and other applications where complex gear ratios are required for the smooth transmission of torque. Because the range of contexts in which gears are applied is so wide, consultation with gear manufacturers in advance of purchase of a gear system is advisable. Industrial Gears Find industrial gears manufacturers and industrial gears suppliers from IQS Directory. Refine your search below by location, company type and certification to find industrial gears manufacturers and suppliers. Use the time-saving Request for Quote tool to submit your inquiry to all the industrial gears companies you select.